AboutClasses Baked Goods Cookies Cakes Pies Seasonal BlogShirts & More! Join me at the kitchen table for good food, classes and order your dessert to take home. I finally took some time to sit down and read through this recipe notebook. It’s not just an ordinary notebook, it’s a treasure from my family lineage. It’s part of my DNA. This is the recipe book of my Great Aunt Ida. She was my Grandpa’s sister. Their parents came from Germany and she looked the part, at least in my eyes. She wasn’t over weight, but she was not a slip of a thing either. She never married. She was a midwife, baker and a wonderful cook. I think her German background played into her baking and cooking expertise. She lived on the family farm in Merrill, Michigan and supplied the bakery in the area with donuts and baked goods. I remember, as a young child being woke up early one morning by my parents. My younger brother and I stumbled into the station wagon half asleep and with my parents headed to the farm to go pheasant hunting. What a day that was! We tripped and occasionally fell through the harvested corn fields with my dad and grandpa looking for pheasants. Little did I know then that cut off corn fields would be a crucial part of my future life. Part of the day my brother and I explored the farm and had a great time in the chicken coop. The chickens, not so much. We also collected a whole bunch of pinecones which had a whole bunch of sap which made my mom a whole bunch not happy. Front porch swinging was more enjoyable with the smell of cinnamon rolls baking in the kitchen. The best part was being in the kitchen with my Aunt Ida, my grandma and mom making fried donuts, cinnamon rolls and bread. Aunt Ida had a huge sink and counter top. Pots and pans galore. Oh my. Heaven will definitely smell like fresh baked bread. Aunt Ida made spaghetti and meatballs for lunch – my favorite. Her kitchen was huge with a large wooden table in the middle. Off to one side of the kitchen the mud room held coats of all sizes and boots galore. The other side led to a sitting room and some bedrooms. We weren’t allowed in the sitting room and I remember being a little afraid of that room. It was dark and looked like it didn’t get used much. Aunt Ida and my grandma wore “house dresses” with aprons and stocking that they rolled down to their ankles just above their very uncomfortable looking shoes. And both always had a smile on their faces and Kleenex in their apron pockets. I was too young to pay attention to what they were chatting about, but, oh how I wish I could go back and listen. I didn’t want the day to end and when it was time to leave, I was close to tears. Within 15 minutes of leaving the farm I was fast asleep in the back seat. Over 40 years later I returned to the farmhouse with my Aunt and cousin for the auction of all of Aunt Ida’s belongings and other farm items. Aunt Ida had passed a few years earlier and it was a wonderful opportunity to go back. Everything looked the same yet different. The porch was smaller and some of the pine trees were gone. The chicken coop hadn’t been used in long time. We found the hidden key and went in to the house and looked around. The emptiness covered the kitchen with sadness. I just stood there and willed myself back in time. A side note – we sort of took the key with us. My Aunt has the skeleton key hanging in her kitchen now. Sadly, the house was going to be demolished so we knew the key had no purpose there. If the items that were being auctioned off could talk what a time, we would all have. We roamed around and “claimed” the items we wanted. We didn’t have the highest bid on all of our wants, but we all walked away with a few items. I purchased one of her quilts for my mother for Christmas. A few months ago, while I was visiting with my Aunt, she brought out this handwritten recipe book and gave it to me. I felt like I was being handed a holy grail. This recipe book had to be easily 60 years old. I felt I was holding precious secrets of Aunt Ida. It looks like she started to try to keep like recipes together. And she added and squeezed in others here and there. 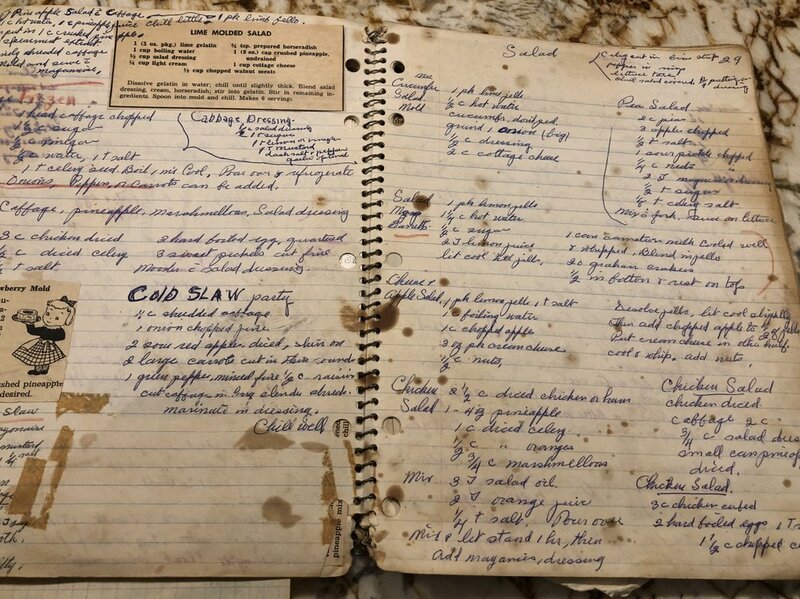 When I look at the handwriting, I picture her sitting at her table scribbling in a recipe after she tried it and liked it. My mother’s handwriting is similar to hers. Reading her notes, trying to follow the path of her instructions that weave around previous recipes fills me with a sacred preciousness. My hands brush across the same pages hers did. The pages are spattered with ingredients here and there. The paper is worn soft on some pages. Probably her favorite dishes. I think I got my desire and ability to cook and bake from her. My daughters-in-law have asked for a cookbook of my recipes and I keep telling myself I will get to it. And, get to it I must. There may come a time when one of my grandkids would sit down with their copy that is worn from their use. They could show their children a recipe and recall a time when they made the dish with their Grama. I hope you have a precious memory journal, cookbook or something to allow your future descendants the ability to “feel” the real you. All food products sold on this website are done so under the the state of Michigan’s Cottage Food Law and are made in a home kitchen (Diane Loew - 1877 Ottogan St. Byron Center, MI 49315). Food products on this website are not inspected by the Michigan Department of Agriculture. Allergy statement: All good products may contain or come into contact with WHEAT, EGGS, PEANUTS, TREE NUTS, and MILK. Check out my other site A Farm Wife for more blogs, articles, podcasts and photos!